. . . and babies make four. : On the twelth day of Christmas . . .
On the twelth day of Christmas . . .
Poppy Dip means "everything is good." It's an expression that Sallee's two-year old loves to say when he's happy. Poppy Dip is also the name of a super cute clothing line for little girls. I've mentioned Poppy Dip and Sallee before but I am so happy to tell you about them again. Sallee is the mother of five beautiful children, two of whom she and her husband adopted from Ethiopia. She also is a very talented seamstress who started making darling little dresses to raise money for their third adoption from Ethiopia. And now Sallee has expanded her clothing line so there are more Poppy Dips than ever to choose from. The dresses now come with either short or long sleeves and she's added pants, twirl skirts and tunics to the line too. And every last piece is beautifully handmade. Happily Sallee is offering one lucky reader their choice of a short-sleeved Poppy Dip dress or a pair of pants in the fabric of their choice. 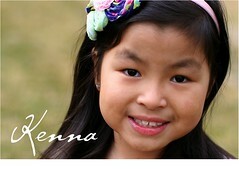 Just go visit her blog and look at all the fun things that she makes and then tell me what you'd choose. Sallee is only taking orders for a couple more days but then she's re-opening her shop on January 15 with a whole new selection of fabrics. 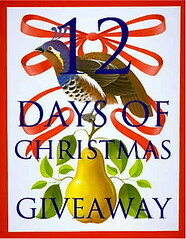 This giveaway will remain open until 12:00 midnight on December 18. I'd pick wildwood wallflower olive fabric - gorgeous!!! Love the tunic dress in the ballerina print and the new print with "children around the world" that is coming in January. They are such lovely dresses. I really like how simple they are, they look pretty but very "playable!" my favourite fabric available at the moment is the Gothic Arch, in a long sleeved dress. Cute, cute, cute!!! The twrl skirt with three tiers is adorable! The pants would be my second choice, lol. I love Poppy Dip! So many wonderful things to choose from. We have a Poppy Dip dress so I think I would choose either the skirt or pants. Very cute. I love the long sleeve dress in the pic. I think it is called Poppy dip Long sleeve. I would have a difficult time choosing. But would probably go with the polka dots that are multi-colored. Sooo cute! I love Poppy Dip ! I have been dreaming over her cute dresses for a while ! I would be happy with any of them ! I like the long sleeve poppy dip dress in wildwood wallflower olive fabric. I love the the twirl skirt with the banded hem. Thanks for having this giveaway. It's been so much fun to see all of the clever products. 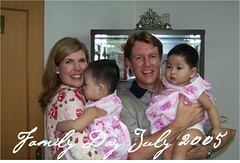 I can't believe it's been 5 years since we waited together and adopted our girls together. Simply amazing. I'm so glad the internet allows us to keep in touch in some small way. Have a very merry Christmas and wonderful new year! They are all so cute, but I would have to say the retro sally swril is my fav! My baby girl would look so darling in one of the short sleeved ruffle dresses... Love the new fabrics for January, particularly the one with the beach sandals! love the poppy dip long sleeve in messanine garden. this dress looks so fun and easy to wear. I would love any of the dresses. Of the fabric currently available, I like wildwood wallflower olive the best. I love the twirl skirt. I have a 5 yr old niece that is just starting to wear skirts and dresses, she would love this. I love the soiree!! It has that great vintage feel to it! I'd pick a twirl skirt...SO cute!! Love the POPPY DIP TWIRL -- 3 tiers with ruffle hem. Adorable. The short sleeve poppy dress would be perfect for our San Diego spring. And I can't wait to see what new fabrics she has to choose from in January! I would pick a short sleeve Poppy Dip dress in the Elizabeth Rose in ice blue fabric. (Here in South Florida we can wear short sleeves almost all year.) Very cute! I love the twirl skirt and I love the new fabrics...especially the pink and green polka-dots and the alphabet print! So cute. For summer I think the fabric with flip flops is just ADORABLE! Darling dresses! The Royal Duo selected Poppy Dip Twirl as their favorite. We have a Poppy Dip dress and love it! I think I'd choose the soiree fabric for our next one! Full bloom graphic rose is GORGEOUS, Mia would love so cute in that dress! I love the long sleeved Poppy Dip dress, but the short sleeved is super cute too. zoey is the proud owner of two poppy dips thanks to your previous post! I always get so many compliments when she wears them! i would choose the elizabeth rose in ice blue- long sleeve poppy dip! Love the good ole short sleeved poppy dip. And loving some of the new fabrics to come. Ohhh... I remember these from a post before. I like the short sleeve dress in wildwood wallflower olive. Love it! 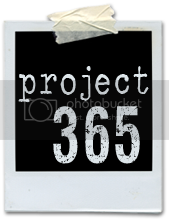 Sallee makes great stuff - thanks to your blogging about her months ago - we've added quite a few to our collection! 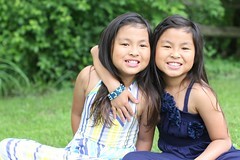 My girls love the twirl skirts...they have "great twirl"! Can't wait to see her new fabrics. I love the one you picked on your blog! 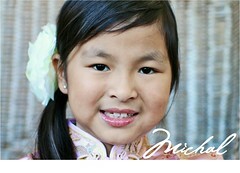 Wow that is a beautiful print on a very beautiful little girl! I'd pick the long pants, I'm a sucker for ruffle pants for my daughter. The fabric for these pants would be the Gothic swirl pink fabric. CUTE! Beautiful dresses! I'd choose the short sleeve dress in the soiree centerpiece passion flower pattern for my daughter. I love them all but think that my Clara Elizabeth would look precious in the Elizabeth Rose! Oh goodness! They are all so adorable! And the little girls modeling the dresses are absolutely beautiful! I'm partial to the long-sleeved tunic dress right now (because it's winter in Chicago!! ), but I love everything on the whole site! I love the poppy dip twirl dress. It beautiful. We have LOTS of Poppy Dip dresses at my house...my girl loves them! Full bloom graphic roses is my favorite fabric! 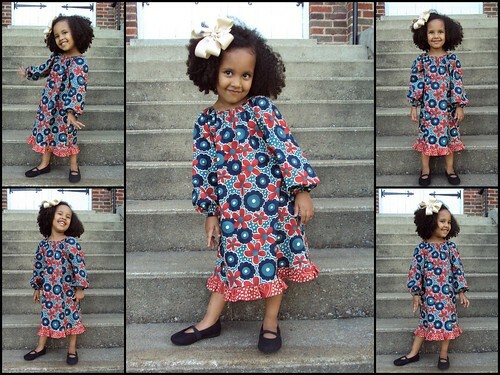 Oh, I must have the short sleeved dress in the new children of the world fabric. So cute! I would love the poppy dip skirt for my darling. the fabrics are all so beautiful not sure what to choose but new print children around the world intrigues me lots. Kristi thanks again. My favorite is the full bloom gothic roses in a short sleeved dress! My niece would love it!! The POPPY DIP TUNIC TOP is darling. The skirts are so cute! The twril skirt with three tiers is super cute! The long sleeve poppy dip dress in wildwood wallflower olive fabric is my favorite! I would pick a dress...hmm maybe pants?!? Can't decide! I like the soiree orange one. but I LOVE a few of the fabrics coming soon too. The dresses are darling! I love the 'gothic arch' fabric... so sweet! The 'full bloom roses' were beautiful too... can't wait to see all her new fabrics in January! wildwood wallflower dress - love her dresses. Yum - love the poppydip twirl with 3 tiers!!! Sooo cute, I remember seeing your girls in some Poppy Dip before. I love it all! I would do a short sleeved dress and cannot decide on a fabric! I love the twirl skirts! I pick Gothic Arch Tunic in 18 months for my sweet grandaughter. She'll be a true winner in this outfit! Oooh! I'd love a dress in MEZZANINE garden fabric. Beautiful! I love the Gothic Arch tunic...so pretty! I will love the ruffle pants, all colors, all patterns. They are just so romantic and lady like! I would be happy with any one of them. I think they are all darling!! The dress in the cupcake fabric, yummy! The twirl skirts are a little girl's dream skirt! So fun! I like the gothic arch fabric and many of the new ones coming in 2010. Love the Gothic Arch!! It would be adorable in a short sleeve dress with cardigan & leggings!! Darling dresses! My favorite is the POPPY DIP TWIRL -- 3 tiers with ruffle hem... LOVE the colors in the skirt also. what fun! i love the fabrics coming up in january, especially the one with pink flowers in a circle with an orange patterned backgroud. darling! I think I'd have to have one of each, eventually. I'd probably start with a twirl skirt, though, and a tunic. You're really going to make me go broke, you know it? The twirl skirt is my favorite - any color fabric. Thanks for sharing. Added to my etsy fave list! The twil skirts are very cute! I love the short sleeved dress with the green chicken & egg fabric! The short sleeve dresses are just so cute! It would be hard to choose just one, but I love the cupcake pattern that has purple in it! Love the dresses and the twirl skirt. The fabrics are all so cute! I love Poppy Dip dresses, but I would choose the long-sleeved dress. Too cute! I love them all... I think i like the pants the best. OH, I can't stand to pick just one- they are all darling darling darling! I love the "Small World" theme print. I think it would be sooooo cute in a short sleve dress. Too cute!!! I've loved Poppy Dip for some time now, especially because she is an adoptive AND craft mama! I'd choose a short-sleeved poppy dip in the Big Green dot +Small Yellow dot fabric (white background) with the green fabric +yellow flower on the sleeves. SOOO cute! thank you! I love them all! The dresses are so cute and I have been wanting to order one for awhile. I also love the 3 tiered skirt! The dresses and tunic top are so cute and the fabrics are scrumptious! I love them all!! I would love the cupcake fabric for Poppy Dip Twirls with the banded edge. so pretty. I just love ruffly pants. My fav is the poppydip ruffle pants using the fun alphabet fabric. I'd be hardpressed to choose between a dress and pants! I love one of the new spring fabrics...dark brown with bright pink and orange flowers! I love the exact dress featured on your blog. SO SO cute! And such an adorable model! So cute! I love the long sleeve tunic dress... and all the fabrics are gorgeous! Very hard choices! We will definitely be getting some of these, too! Most likely a wildwood wallflower olive. I love the twirl skirts and the ruffle pants and the dresses...I guess I love everything! Love the poppy dip swirl with three tiers! How cute! I wish I could sew like this! But, you remember my sewing skills when we made Ryan's lion costume! My favorite is the brown with hot pink and orange flowers in a dress. I love these! My favorite would have to be the floral ones! Love the longsleeve poppy dress!